Georgia Coast Design and Construction - Bert's Builder Blog! 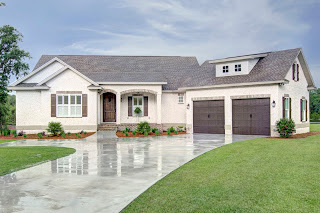 Bert's Builder Blog - news, tips and expert advice from Coastal Georgia's very own Southern Living Custom Home Builder. Nothing says “coastal construction” like tabby. Tabby is a multi-layer concrete siding that is embedded with oyster shells. The shells can be broken or whole, or a combination of the two. Tabby has a long history in our area. In 1733 General James Oglethorpe initiated the use of tabby construction in Coastal Georgia. His own St. Simons Island home, Orange Hall, was built of tabby material. Historical tabby construction can still be found throughout the Golden Isles, and the use of tabby is just as popular today as it was hundreds of years ago. We at Georgia Coast Design & Construction have used tabby in many different ways. In exterior applications of some of the homes we have built, we’ve covered areas such as the foundation and siding. We often mix the use of tabby with other siding materials, so that one part of the exterior may be tabby, another part brick, another part stucco, and another part Hardie Board. We find tabby is popular not only for its aesthetic, but also because it is maintenance-free and holds up extremely well in our humid coastal climate. We have also used tabby in interior applications. It is not unusual to make tabby part of a coastal fireplace surround or to finish an accent wall in tabby. The Southern Living Showcase Home we built several years ago featured a curved tabby bathroom wall that framed an oval free-standing tub. Let us help you with the design of your next house, so that it can be just as beautiful and interesting as it can possibly be. Scroll down below to view some of the interior and exterior examples of tabby construction we have done, and let your imagination run free at the possibilities of what you could do, too! This gorgeous kitchen is in the Southern Living Showcase House we built on St. Simons Island. Made for entertaining, it is open to the Great Room and includes many unique features. The large island has tight louvre panels on the sides and back; on the sides of the island the panels are overlaid with crossing 1x3" trim. The stunning countertop is oyster blue granite literally mined from the bottom of the Mediterranean sea. Look closely and you can see the outline of the oysters in the granite. All of the base cabinets feature heavy duty soft-close shaker style drawers. 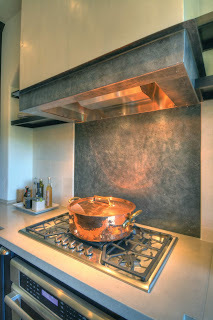 The top-of-the-line gas cooktop has a built-in oven below it, and the unique hood liner and backsplash are made out of beaten metal specially treated to look like distressed zinc. Floating stained oak shelving are recessed on each side of the hood liner, with an arched ceiling above them. The hood box and walls on each side are both plastered. The counter-to-ceiling built-ins on each side of the open shelves provide large amounts of pantry space and storage. The countertops over the base cabinets are a combination of quartz and honed concrete. The beautiful wood flooring is 8" wide distressed hickory and the entire kitchen looks out over the oversized picture window with a view of a lake. The total effect is finished out with a marvelous chandelier and bar stools which have been custom upholstered to match the color of the island. Building a custom home allows you to incorporate numerous details and "extras" such as the ones in this Southern Living Showcase Home. Georgia Coast Design and Construction has the construction experience and design knowledge to make your home-building dreams a reality. Contact us to discuss what we can do for you! Details truly set the tone and make the difference when designing a custom home. Elegant and classic, this curving staircase features four (4) landings and an over-the-newell-post handrail system that utilizes multiple gooseneck fittings to make everything work smoothly. The gorgeous oak handrail begins with an elaborate volute on the first tread, and custom preacher's panels run alongside the stairs and throughout the foyer to complete the warm, harmonious feel. The foyer opens into an expansive great room with a 12 ft wide x 8 ft tall sliding door that looks out onto the marsh, letting in natural light throughout the downstairs. The great room also has a graceful coffered ceiling and a traditional fireplace with oversized built-in entertainment centers flanking it. 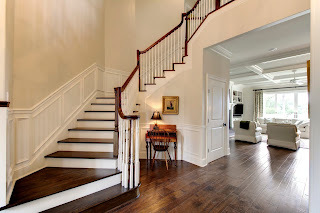 Building a new custom house allows you the flexibility to include beautiful features such as these. Let Georgia Coast Design and Construction design your dream house. Every home should have a walk-in butler’s pantry. 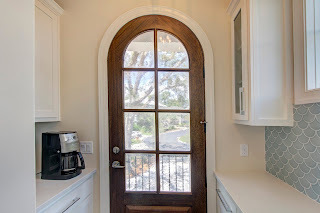 This one maximizes the available space with wall and base cabinets on each side, and a beautiful stained knotty alder arched top door onto an open balcony. The large amount of seeded glass in the door lets in plenty of light, but provides privacy as well. The wall cabinets have glass doors, and the back splash is custom-ordered fish scale tiles that are installed in individual pieces for a warm and sophisticated look.